Since this is Makeup Magazine, guest editor-in-chief Isabel Roces wanted my cover look to be a total makeup transformation. None of my usual sweet girl-next-door makeup but more sultry and mature makeup that’s perfect for fall. I must admit, I was a bit scared at first–especially when I saw the lipstick shade makeup artist Lizzie was going to use on me. You all must know by now how I avoid dark lip colors like a plague. Not that I think they’re ugly (I’m always secretly jealous of girls who can pull them off) but I just never thought they suit my features. But hey, I’m a trooper. Shooting editorials with concepts that are different from my usual make me excited. I welcome them wholeheartedly because it’s not everyday you get to play pretend and dress-up. So, I just closed my eyes and hoped for the best. Surprisingly, I liked how the lippie looked on me. I don’t know if it’s just Lizzie’s magical makeup hands but it worked! I just might start experimenting with darker lipstick shades soon. 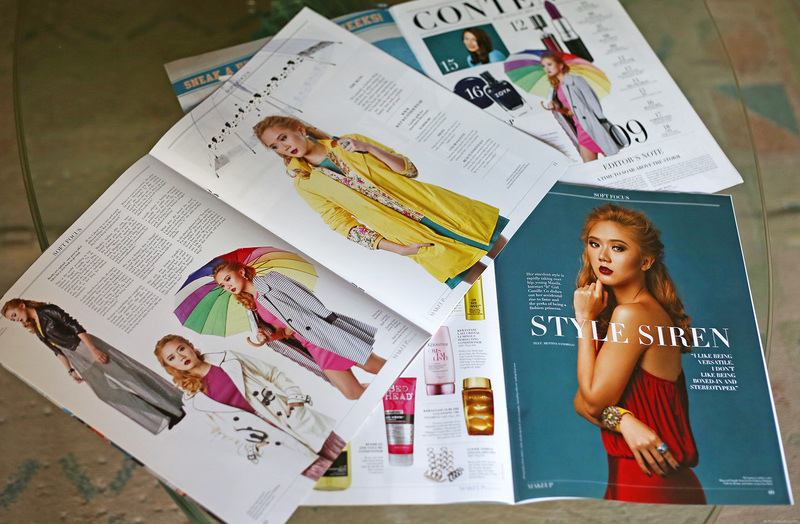 This particular issue of Makeup Magazine focuses on the rainy season so to go with my sultry makeup, stylist Chanda dressed me in the cutest coats and umbrellas. 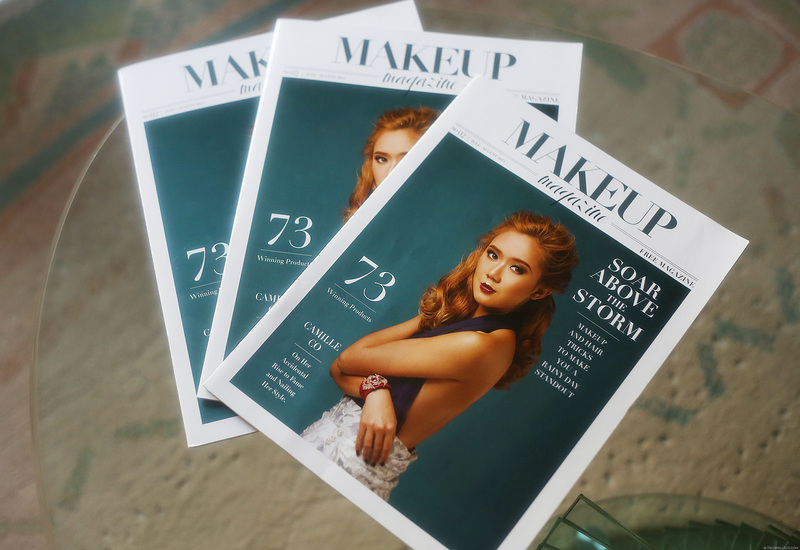 Inside this issue, you’ll find tons of interesting stories and editorials to help beauty addicts battle the rainy season. Aside from my cover story which I won’t spoil, you must watch out for celebrity makeup artist Robbie Pinera and actress Cheska Garcia-Kramer’s beauty tips and must-haves. I won’t spoil those either because you must grab a copy to read the articles for yourself! I will, however, share with you the final photos of me that made the cut and a few behind-the-scenes photos from the shoot, including one of me munching on snacks like the little miss piggy that I am while everyone else was fussing about around me; and one where stylist Chanda is lifting my dress’ skirt up for the sake of getting the shot while my assistant Clariss panics about my underwear getting exposed. Ohhhh the glamorous life of fashion, right? Either way, it was a quick and fun shoot, thanks to Makeup Magazine’s easy-going team. Thank you once again for choosing me to be your cover girl! I’m beyond flattered and I hope I didn’t disappoint. Fingers-crossed! P.S. I’m still sporting my light blonde hair here because these photos were taken from a while. Do not fret, I still have my dark hair now. Watch the video below for more behind-the-scenes action! Cool! I thought before that light colors only suits you but WOW! This one is really amazing! You look totally different from your usual photos, I love your fierce aura! Thanks Maica! I thought so too! Am I not normal? I only noticed the cameraman a.k.a Advan (baliktad ata noh?) when almost all the comments mentions abt him. Napa-scroll up tuloy ako ng wala sa oras. hahahahaha. You always fail on your diet? With a body like that?? Parang di naman kapani-paniwala!!! Hahaha! Che, yung photographer napapansin niyo lahat! Haha :) Just kidding :) Thanks Gladys! Stunning!! It’s been a pleasure to see your growth and transformation. It so look different Camille, but sobrang bagay sayo ang dark lippie. Haha! You mean physically? I really look at the way a guy dresses. And then grooming :) Kailangan malinis! :) Advan is really nice! And married, sorry girls! this is so totally different! But it suits you so well! Congrats cams! Congratulations on making this cover. You look so different but absolutely stunning. Wow, congrats! You look stunning in these photos, and those outfits are just amazing! You look different! Very Edgy and chic! I salute the hair and make up artist. They pulled off a different look on you Ms. Camille. Different from your usual pastel sweet girl looks. You look superb! I liked transparent skirt that surprised me . That lipstick is like a red rose petal and your passion ruby color dress tight in hips is beautiful . The hair is in most often , the first thing I seek in a woman , i love hairstyles and in these photos you shine like a star. I loved your eyes in last picture with allblack look . Good place to get the magazine right? :) Thanks Anne! Love the makeup looks! The pop of red on the lips is flattering for everyone, I love experimenting with it! You look absolutely stunning, Camille! The makeup, the clothes, everything is just perfect. I actually have never heard of this magazine before but I’ll be sure to go to J.Co at Alabang Town Center to get my hands on a copy (lol. ginawa pa ‘tong excuse eh noh para makakain ng doughnut? haha). You know you’re my style icon and favorite fashion blogger, so I need the mag for my collection. It’s still new! :) Thank you Kyle! Perfect excuse to eat a doughnut!! Haha! Si photographer pala yung tinutukoy ko. HAHAHAHA! Tyaka na yang si Videographer pag may budget. HAHAHA! Kasi naman akala ko from L-R ang sequence Camille! Nilinlang mo ang damdamin ko. charos. Basta yung nasa rightmost. Hahahahahaha! :) You are so funny!! I think you’re referring to the photographer Advan bilang siya rin yung napansin ni Kay. LOL! Oh my gosh! Advan is a cutie!!! Waaahh! Did you also find him cute? Hahaha! Don’t worry Camille, you look beautiful in your mature make up :) The make up artist is really good though…I hope you could blog more of you BTS shoots because it’s fun to watch the real actions in your work :) by the way, I’m curios, which one do you prefer, hot shots or fun shots? Hahaha! Omg assistant clariss!! :)) hehe. You look so cute and fierce (idk why you can pull off both looks at once hihi) while eating the kfc shots i think? You really look different here. You look so strong and fierce.